On Thursday December 22nd, Salon Success Academy joined the Spark of Love Toy Drive to provide gifts to children throughout Long Beach who would have otherwise gone without this holiday season. Each year the program provides for some 400 families. What was started in the early 1950s, by Murray Cohn, a firefighter who saw local residents in need, has spread to areas way beyond just one fire station. Fast forward to 1992, the collective decision was made to expand the program into a regional toy drive known as “Spark of Love. With this development, local area fire departments teamed with ABC Channel 7 for financial backing, supplies, and media coverage. 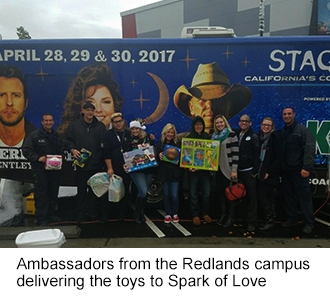 According to Spark of Love, along with the toys, the program builds goodwill within the community and provides kids with positive role models. Each December, toys are collected at various city events from businesses and schools, and from residents who can drop off their donations at fire departments. The program runs with the help of lots of volunteers and this year the Salon Success Academy Student Ambassadors were a part of Spark of Love. The Student Ambassadors are important members of the Salon Success Academy family. In addition to the Spark of Love Toy Drive, Ambassadors work throughout the year on projects and causes. They help with new student orientations and choose charity events to support. Our Ambassadors also help students find success in the classroom, on their respective campuses and ultimately within the community. If you want to train for a new career among people who really care about you and others, come talk to us at Salon Success Academy. We’re a people helping company, ready to help you! Call us at 1-877-987-HAIR (4247) or fill out the form to learn more about all we have to offer.